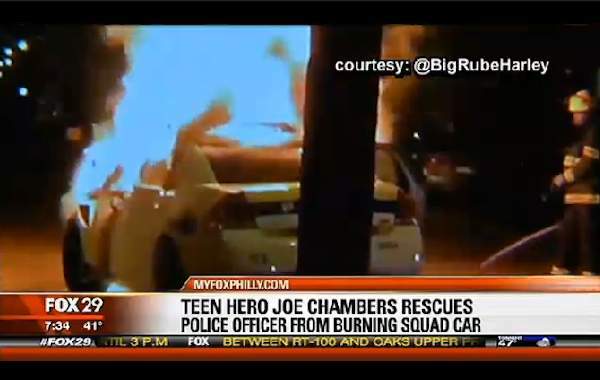 Joe Chambers, 17, a volunteer firefighter from Ridley Park, Pennsylvania, heard a loud crash outside. The teen ran outside to find that a pickup truck had collided with a patrol car, and Officer Mark Kimsey, 30, was trapped inside. Chambers knew it was time to step up. “I started running full speed down the street and as I got to the car, the bottom of the car caught fire and then the hood caught fire . . . the door was jammed shut,” he told the Philidephia Inquirer.